I first made this Pimento Cheese and Tomato Pie when I was in grad school at the University of North Carolina. My friend Emily Wallace (the other Emily Elizabeth) was writing her Master's thesis on the history of pimento cheese and we wanted to combine our two food loves into one dish for a potluck at our professor Marcie Cohen Ferris' class. I wasn't too familiar with pimento cheese until I moved to North Carolina. I'd had casual encounters with the stuff--at potlucks and in tubs at the grocery store--but without context, the mixture of cheddar cheese, pimentos, and mayonnaise just seemed like a sad deconstructed cheese ball to this Midwesterner. But I came to the Piedmont at just the right time for some pimento cheese schooling. Not only was the iconic sandwich spread becoming a trend across the U.S., appearing in everything from cheesecake to jalapeno poppers, but my fellow Emily Elizabeth was deeply entrenched in a study of pimento cheese's cultural history--which happened to hit upon some of my own research interests like women's domestic creativity and entrepreneurship. According to Emily in this Indy Week article, pimento cheese was considered a dainty treat across the nation at the turn of the 20th century. Finger sandwiches made with the spread were a delicacy, particularly because the Spanish-imported pimentos were expensive and hard to come by. By 1915, Kraft had processed the spread and farmers began to grow their own pimentos stateside. In the Piedmont of North and South Carolina, textile mills offered lunches from dope carts, which sold sandwiches with various spreads, including pimento cheese. Soon small companies, often with women at the helm, supplied the food carts with sandwiches. Wallace says, "These women used food as a means to escape the drudgery of home or other unwanted employment, such as a textile mill. And pimento cheese—food that was considered part of a women's domestic domain—was a window not only into work but also business ownership, financial independence, and creativity in ways that were nonthreatening to gender roles of the time." Now I eat my pimento cheese, whether as a sandwich, on my grits, or in a pie, with pride, knowing that it traces back to a long line of enterprising women, sure, but also because it tastes damn good. 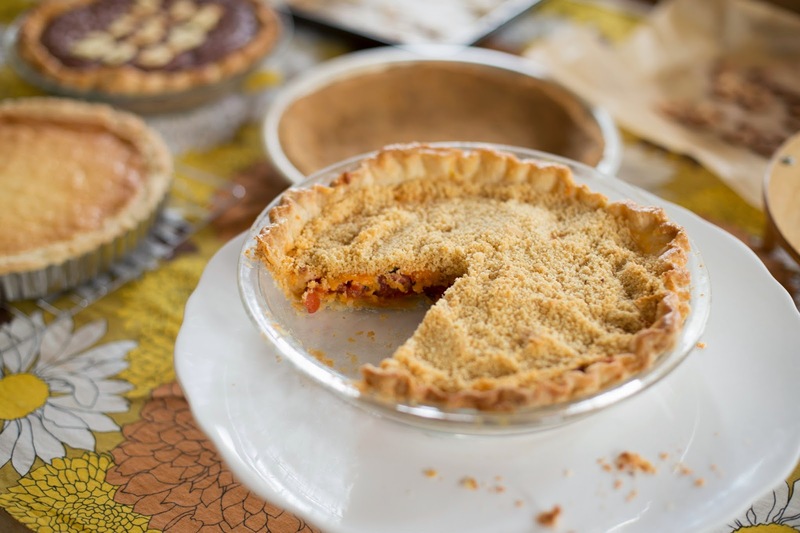 This pie recipe came to us from our friend April McGreger of Farmer's Daughter Brand Pickles and Preserves. She adapted it from The Southern Foodways Alliance's Community Cookbook. Though best with fresh tomatoes, it's become a Pi(e) Day staple and was included in this article on Pi(e) Day and female friendship that my friend Lora Smith and I wrote for Ronni Lundy's Zenchilada. 1. Prepare half of the Nothing-in-the-House pie crust as per the directions. Chill dough at least 1 hour before rolling out and fitting into a greased and floured 9-inch pie pan. Place pie plate in fridge for about 20 minutes. Meanwhile, preheat the oven to 375 degrees F.
2. Once you've let the pie crust chill, prick crust with a fork all over the bottom. Line crust with parchment paper and pie weights or dried beans and bake for 25 minutes. After 25 minutes, remove weights, reduce temperature to 350 degrees F and bake until crust is golden brown, about 20 minutes more. Let crust cool completely and leave oven on for the tomatoes. 1. Drain the tomatoes (if using canned--and keep the juice for Bloody Marys!) and dice them into 1-inch pieces. In a medium bowl combine the tomatoes, basil, salt and pepper, and half of the olive oil. Toss with your hands until all the tomatoes have a little oil on them. Pour the remaining half of the olive oil onto a sheet pan, rubbing with your hands to coat the bottom of the pan. Spread the tomatoes on the pan in a single layer. Roast the tomatoes in the oven about 15 minutes or until they dry up a little and start to shrivel slightly. 2. Fill the bottom of the pie crust with the tomato mixture. Spread the prepared pimento cheese over the tomatoes. In a small bowl, toss bread or Ritz cracker crumbs with melted butter, garlic, parmesan cheese and pepper, and sprinkle over the top of the pie. 3. Place pie in oven 10-15 minutes, just enough to warm and brown the crumb top. Remove from oven and serve slightly warm. I've been making Stephanie of 3191's recipe for Pimento Cheese for a few years now--it's become a New Year's Eve tradition (served with Sweet Potato Biscuits) that my family now requests. But I wanted to include Emily Wallace's grandmother recipe--which is also delicious and shows some of the variation in style. Of course in North & South Carolina you're pretty much required to make it with Duke's mayonnaise--if you do make it with Hellmann's or another sweet mayo, I might not include the sugar. 1. Grate cheese into a medium-sized bowl and add entire contents of pimento jar. Mix with a wooden spoon. Add other ingredients and stir to combine. Taste and add any more of the above ingredients according to your preference. Labels: North Carolina, pi day, pimento cheese and tomato pie, savory pie, Vegetarian, Washington D.C.